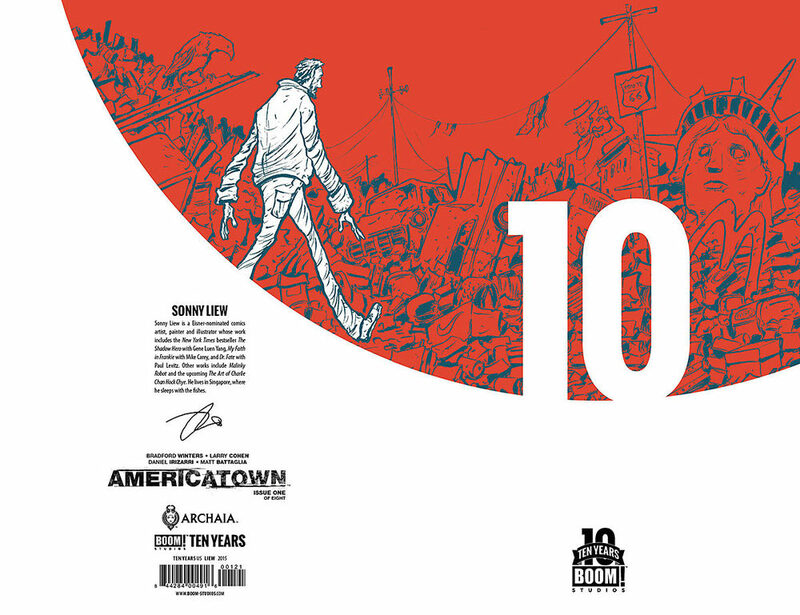 This week, our #1 review will take a look at John Flood, from Boom! Studios. Check below for a synopsis and preview pages. 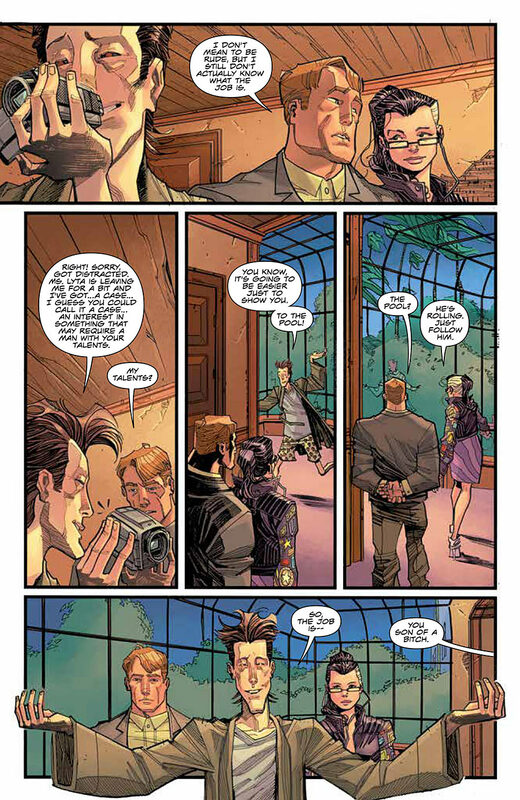 What’s to Love: Justin Jordan exploded onto the comics scene just four short years ago with The Strange Talent of Luther Strode and caught everyone by surprise. Now he brings us John Flood, a series that combines the metaphysical with the procedural in a way we think is really fresh. Joining him is Jorge Coelho, whose fantastic work on Polarity and Sleepy Hollow made him a BOOM! favorite. Perfect for fans of Desolation Jones and Sherlock Holmes. What It Is: Four childhood friends discover a box of strange books that, when read aloud, can transport them to the beautiful, imaginary worlds described within. But when one of them goes missing, the others vow never to reveal where they’ve been and what they’ve seen. Years later, when one of the remaining kids, now an adult, also mysteriously disappears, it’s up to the last two of the group to dig up their dusty books to find him and finally figure out what happened to their friend all those years ago. WHY WE LOVE IT: Punk rock isn’t dead...yet. Turf wars, breaking rules, crushing violence, and Black Flag—these are a few of our favorite things, and we can’t wait for Curb Stomp to straight-up knock our teeth out (in a good way). 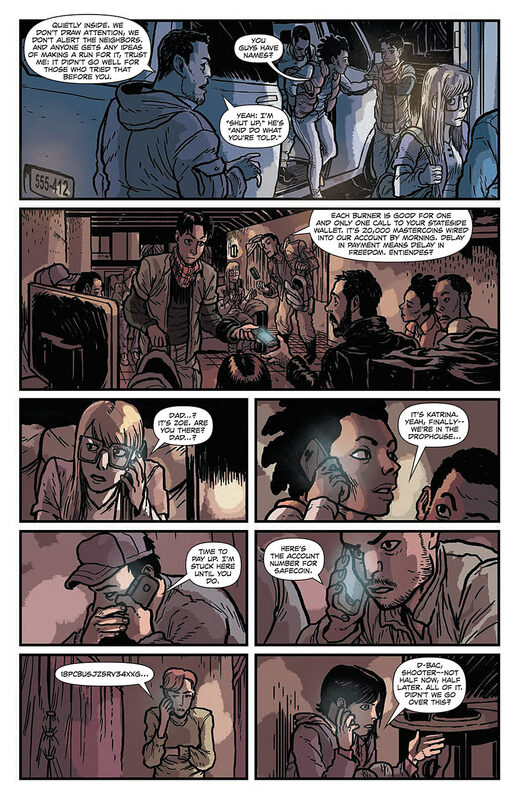 WHY YOU’LL LOVE IT: Writer Ryan Ferrier (D4VE) is a creator on the rise, and newcomer Devaki Neogi’s art will hook you with its aggressiveness but keep you coming back with its heart. 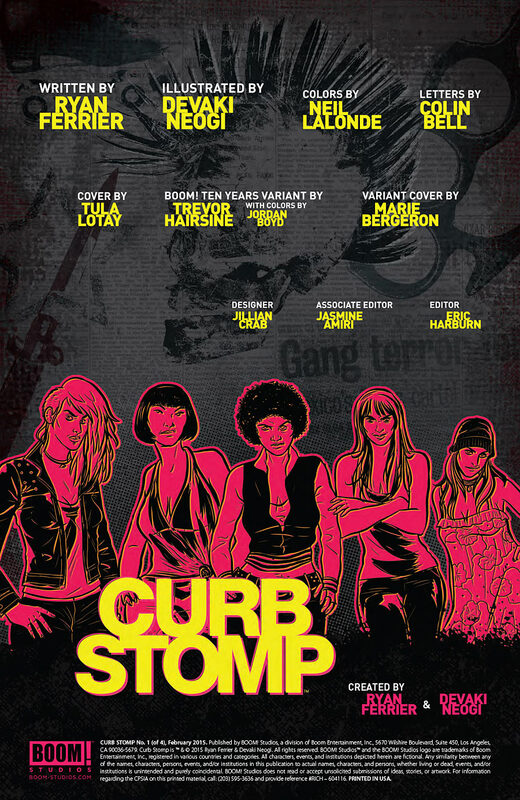 Curb Stomp is an unflinching, visceral look at the lengths one woman will go to protect her friends, her family, and her home—perfect for fans of Rat Queens and the seminal ‘70s cult-favorite film The Warriors. WHAT IT’S ABOUT: Three gangs. Five girls. No way out. 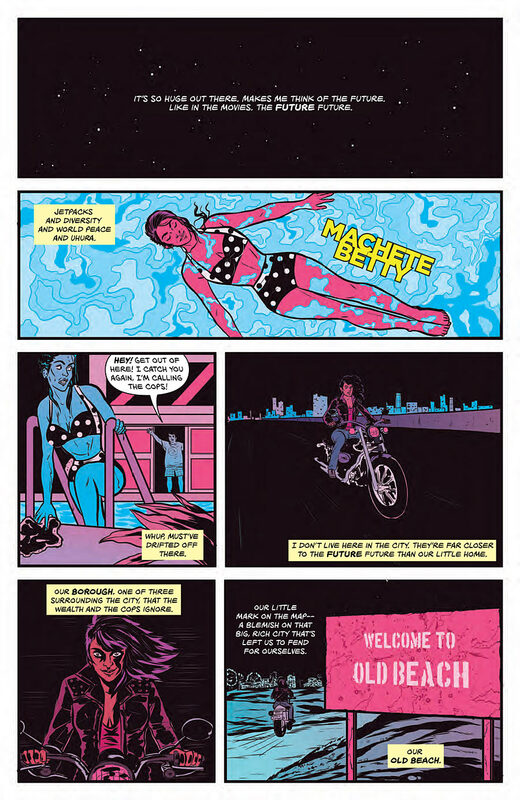 Machete Betty leads a small gang of women under the self-appointed task of protecting their home of Old Beach, one of three boroughs surrounding a rich metropolitan city. 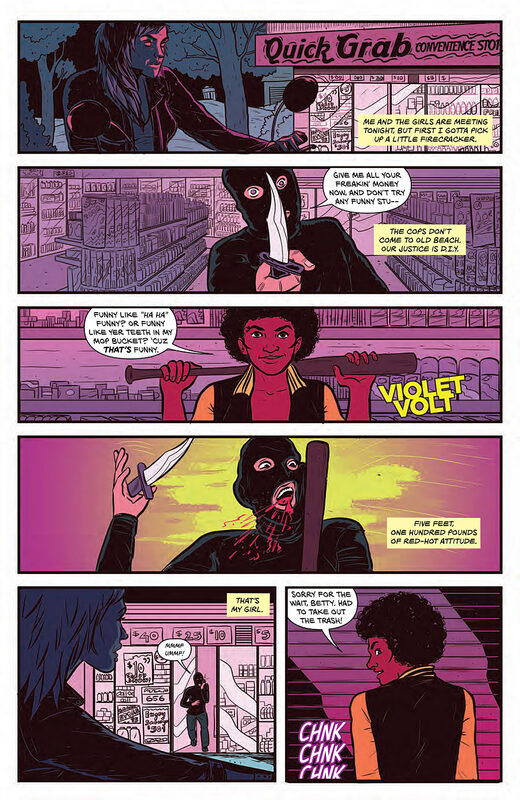 When Betty takes the life of a rival gang member in an act of self-defense, she sets off a chain reaction of retaliation, gang warfare, and unlikely allies. It’s up to the The Fever—Machete Betty, Derby Girl, Bloody Mary, Daisy Chain, and Violet Volt—to defend their turf at all costs.